A demon slave of the mighty Azathoth is forced to view all moments in human civilization, and is then incarnated into mortal flesh to teach man of his own history. He tries to communicate with the mortals through their own language, but is only able to gibber out an alien madness, a corrupted blasphemy of thought that serves only to poison the minds of any unfortunate enough to hear the message. Blood leaks from the ears as brains soften, becoming ever more palatable to the unholy banquet of Chaos. This album is from Hekaloth Records, somewhat better known for their similar project, Shevalreq. A Feast for Famished Ravens revolves primarily around historical events of the early Medieval period. The Hekaloth website has since gone offline, but one can still access some info on this album with the "wayback machine." Raw synth tones repeat atonal melodies with seemingly no reasonable arrangement. The bass ceaselessly wanders along playing random dissonance. A black metal growl is also ever-present, barking out lyrics that have the historical specificity of a textbook. As one would expect, all these disparate elements manage come together to create a perfect hole, evoking the pleasant feelings of restlessness and nausea in the listener. The abyss gazes first here. One needs only listen to the sample track below to recognize that this is the greatest dungeon synth album ever composed, if not the greatest work of musical art. Mortiis is dead! 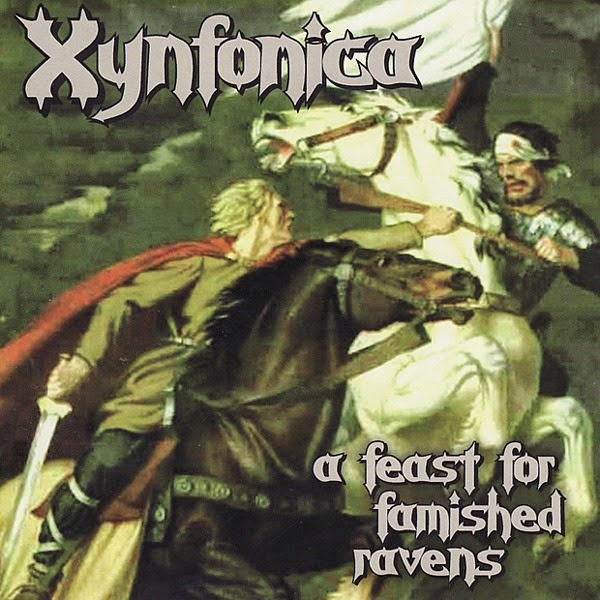 Long live Xynfonica! All other dungeon synth is now irrelevant. Give your sanity to the feast of Xynfonica or suffer the wrath of the primordial sultan himself. Seriously though, this is probably the worst album I've ever heard, which makes it somewhat fascinating to me. Thanks. I didn't know about Xynfonica. After reading your review, I managed to find a place for listening the album online. Then I totally understood your perplexity. Great post, there are always something odd waiting to be found. Oh hell I think I remember this! I took a listen to a few more than I should've of the infamous Hekaloth releases... let's say the other year, and pretty much all were exceptionally hideous. I now almost feel a perverted urge rising in the probably then damaged part of my brain to listen to their things again! Thanks for the review. Oh, one I thing I want to point out is that logo. Look at that logo! any chance of a full upload of this / other Hekaloth music ? I'm also hoping to get in touch w/ the person / people behind Hekaloth . please contact zphillips @ gmail dot com if you have any information !